Review by AllTheBestFights.com: 2019-04-20, disappointing fight between Terence Crawford and Amir Khan: it gets two stars. The undefeated world champion in three different weight classes Terence Crawford entered this fight with a perfect record of 34-0-0 (25 knockouts) and he is ranked as the No.1 welterweight in the world. In his last three bouts he has beat Julius Indongo (Terence Crawford vs Julius Indongo), Jeff Horn (Jeff Horn vs Terence Crawford) and Jose Benavidez (Terence Crawford vs Jose Benavidez). His opponent, the former Olympian and former world champion Amir Khan, has an official boxing record of 33-4-0 (20 knockouts) and he entered as the No.10 in the same weight class. He was defeated by Saul Canelo Alvarez in 2016 (4-stars fight, Saul Canelo Alvarez vs Amir Khan) but he came back to win in 2018 beating Phil lo Greco (Amir Khan vs Phil Lo Greco) and Samuel Vargas (Amir Khan vs Samuel Vargas). 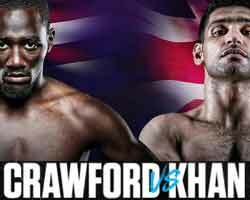 Crawford vs Khan is valid for the WBO World welterweight title (Crawford’s second defense). Watch the video and rate this fight! 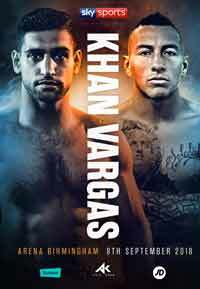 Review by AllTheBestFights.com: 2018-09-08, good fight between Amir Khan and Samuel Vargas: it gets three stars. The former Olympian and former world champion Amir Khan entered this fight with a professional record of 32-4-0 (20 knockouts) and he is ranked as the No.11 welterweight in the world. He was defeated by Saul Canelo Alvarez in 2016 (4-stars fight, Saul Canelo Alvarez vs Amir Khan) but he came back to win in 2018 with Phil lo Greco (Amir Khan vs Phil Lo Greco). His opponent, Samuel Vargas, has a boxing record of 29-3-2 (14 knockouts) and he entered as the No.52 in the same weight class. He also lost in 2016, with Danny Garcia (Danny Garcia vs Samuel Vargas), but then he has collected four victories and one draw, against Mauro Godoy. Khan vs Vargas is the main event of the evening. Watch the video and rate this fight! Review by AllTheBestFights.com: 2018-04-21, one sided fight between Amir Khan and Phil Lo Greco: it gets two stars. The former world champion in two different weight classes Amir Khan entered this fight with a boxing record of 31-4-0 (19 knockouts) but he is not ranked as he hasn’t fought since May 7, 2016 when he was defeated by Saul Canelo Alvarez (4-stars fight, Saul Canelo Alvarez vs Amir Khan). Before this bout, in 2015, he had won over Chris Algieri in his last two (Khan vs Algieri). His opponent, Phil Lo Greco, has an official record of 28-3-0 (15 knockouts) and he entered as the No.101 super welterweight in the world. He lost to Joseph Elegele in 2016 but he came came back to win in 2017 with Jesus Gurrola. 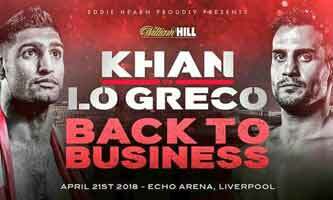 Khan vs Lo Greco is the main event of the evening. Watch the video and rate this fight! Review by AllTheBestFights.com: 2016-05-07, good fight with a spectacular finish: Saul Canelo Alvarez vs Amir Khan is one of the best boxing fights of the year 2016 and it gets four stars! The Wbc Mw champion Saul Alvarez entered this fight with a boxing record of 46-1-1 (32 knockouts) and he is ranked as the No.1 middleweight in the world. He suffered his only loss when he faced Floyd Mayweather Jr in 2013 (=Mayweather vs Alvarez), after this bout the Mexican has won four consecutive fights defeating James Kirkland (boxing Fight of the Year 2015, Canelo vs Kirkland) and Miguel Cotto (=Cotto vs Alvarez). His opponent, the former world champion in two different weight classes Amir Khan, has an official record of 31-3-0 (19 knockouts) and he entered as the No.4 welterweight. He lost two consecutive fights between 2011 and 2012, against Lamont Peterson (=Peterson vs Khan) and Danny Garcia (=Garcia vs Khan), but since then he has won five bouts beating Devon Alexander (=Khan vs Alexander) and Chris Algieri in his last two (=Khan vs Algieri). 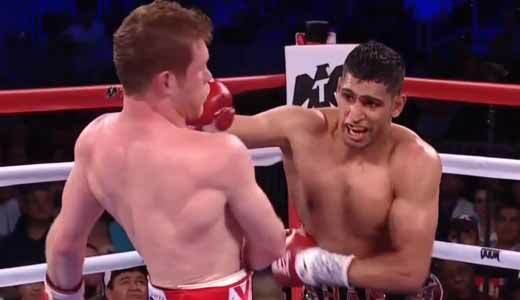 Canelo vs Khan is valid for the WBC World middleweight title. Watch the video and rate this fight! Review by AllTheBestFights.com: 2015-05-29, pretty good fight between Amir Khan and Chris Algieri: it gets three stars. The former Wba and Ibf light-Ww champion Amir Khan entered this fight with a professional boxing record of 30-3-0 (19 knockouts) and he is ranked as the No.6 welterweight in the world (currently the #1 in this division is Floyd Mayweather Jr). He suffered two consecutive defeats between 2011 and 2012, against Lamont Peterson (=Peterson vs Khan) and Danny Garcia (=Garcia vs Khan), but since then he has won four bouts beating Luis Collazo (=Khan vs Collazo) and Devon Alexander in 2014 (=Khan vs Alexander). His opponent, the former Wka and Iska kickboxing world champion Chris Algieri, has an official record of 20-1-0 (8 knockouts) and he entered as the No.14 in the same weight class. He won the Wbo super-Lw title in 2014 when he faced Ruslan Provodnikov (=Provodnikov vs Algieri) but then he moved up in weight class to the welterweight division suffering his first loss against Manny Pacquiao (=Pacquiao vs Algieri). Khan vs Algieri is valid for the WBC Silver welterweight title. Watch the video and rate this fight! Review: 2014-12-13, fight not particularly exciting between Amir Khan and Devon Alexander: it gets two stars. The former Ibf and Wba light Ww champion Amir Khan entered this fight with a professional boxing record of 29-3-0 (19 knockouts) and he is ranked as the No.11 welterweight in the world (currently the #1 in this division is Floyd Mayweather Jr); he suffered two consecutive defeats between 2011 and 2012, against Lamont Peterson (4-stars-fight, Peterson vs Khan) and Danny Garcia (=Garcia vs Khan), since then he has won three bouts, the last one against Luis Collazo (=Khan vs Collazo). His opponent, Devon Alexander, has an official record of 26-2-0 (14 knockouts) and he entered as the No.8 in the same weight class, he has won world titles in two different weight classes but he was defeated by Shawn Porter last year losing the the Ibf Ww belt (=Alexander vs Porter), after this bout he came back to win beating Jesus Soto Karass (=Alexander vs Soto Karass). Khan vs Alexander is valid for the WBC Silver welterweight title. Watch the video and rate this fight! Review: 2014-05-03, fight not particularly exciting between Amir Khan and Luis Collazo: it gets two stars. Amir Khan entered this fight with a pro boxing record of 28-3-0 (19 knockouts), he is not ranked as he hasn’t fought since April 27, 2013 when he defeated Julio Diaz by unanimous decision (his debut in the Ww division, Khan vs Diaz). His opponent, Luis Collazo, has a record of 35-5-0 (18 knockouts) and he entered as the No.20 welterweight, he suffered his last defeat in 2011 when he faced Freddy Hernandez, since then he has fought and won four times. Khan vs Collazo is valid for the vacant WBC Silver and WBA International welterweight titles; undercard of Floyd Mayweather Jr vs Marcos Maidana. Watch the video and rate this fight! Review: 2013-04-27, even though there was one knockdown, the fight between Amir Khan and Julio Diaz was not so exciting: it gets two stars. Amir Khan (27-3-0, 19 KOs) entered as the No.6 light welterweight in the world while Julio Diaz (40-7-1, 29 KOs) entered as the No.37 welterweight. Khan vs Diaz is the main event of the evening. Watch the video! 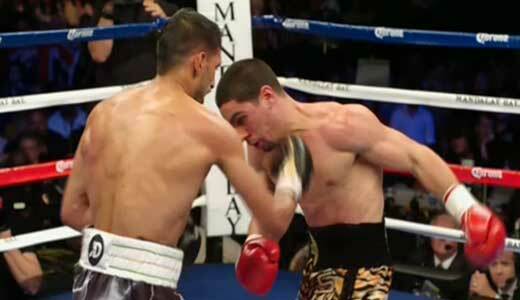 Review: 2012-12-15, pretty good fight between Amir Khan and Carlos Molina: three stars. Amir Khan (26-3-0) entered as the No.6 light welterweight in the world while the undefeated Carlos Molina (17-0-1) entered as the No.76 lightweight. Khan vs Molina is valid for the vacant WBC Silver light welterweight title. Watch the video! Review: 2012-07-14, great exchanges, speed, power, technique and three knockdowns: Amir Khan vs Danny Garcia is definitely one of the best boxing fights of the year, four stars. Amir Khan (26-2-0) entered as the No.3 light welterweight in the world while the undefeated Danny Garcia (23-0-0) entered as the No.5. Khan vs Garcia is valid for the WBC and WBA Super World light welterweight titles. Watch the video!